Hanukkah is celebrated on the 25th day of the month of Kislev, the Jewish calendar, which can be in early November or late December. 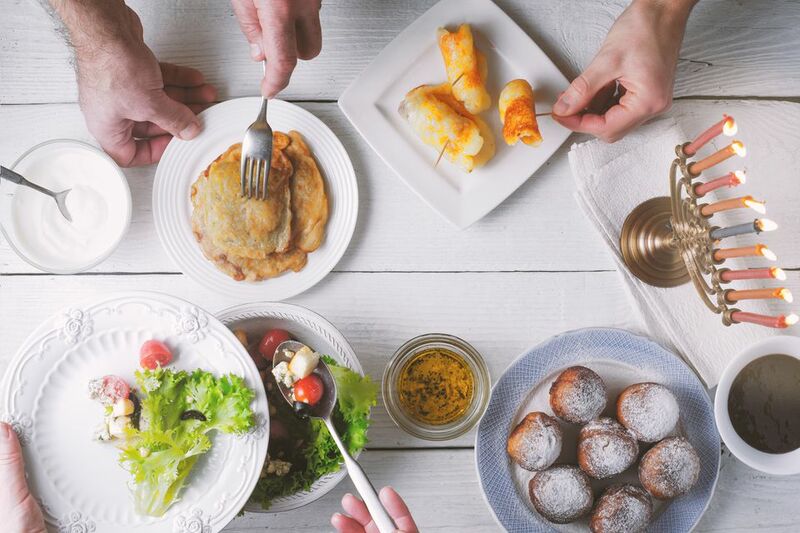 During the Hanukkah holiday, families eat latkes (potato pancakes), sufganiyot (round jelly doughnuts), and other foods to celebrate the miracle of the Festival of Lights. The miracle is about a night’s supply of lamp oil that provided light for eight nights, which took place during the rededication of the Holy Temple of Jerusalem. This Jewish holiday celebrates many traditions like playing the dreidel game and lighting the menorah (the lamp more traditionally called the “hanukkiah”) with the recollection of stories of the Maccabees and nights long ago. Though the traditional holiday doesn't include opening presents, the holiday's proximity to Christmas has created a new tradition of buying presents for children. Another newer tradition in the United States is the baking of butter cookies or pretzels in the shape of Hanukkah symbols while relating the stories. Children delight in helping to make cookies and learning about traditions as they create and eat as well. Traditional Hanukkah holiday foods are not for the faint of heart since most are fried and/or loaded with cheeses. These traditional special treats, along with unconventional variations of Hanukkah recipes, are sure to please all, even if you're not Jewish. According to Jewish law, Hanukkah is one of the less important Jewish holidays. However, Hanukkah has become much more popular in modern practice because of its proximity to Christmas. The traditional foods consumed during the Hanukkah holiday are symbolic of the events being celebrated. Most of these traditional foods are fried in oil, symbolic of the oil that lasted eight days. Others contain cheese to celebrate Judith's victory. Three popular foods eaten on the Jewish holidays include loukoumades, pancakes, and latkes. Loukoumades are deep-fried puffs dipped in honey or sugar to represent the cakes the Maccabees ate, along with sufganiyot and zelebi. Pancakes are a traditional dish, serving as a reminder of the food hurriedly prepared for the Maccabees as they went into battle, along with the oil they are fried in as a reminder of the miraculous oil. Latkes were originally symbolic of the cheesecakes served by the widow Judith and later evolved to the potato/vegetable fried most known today. Many kinds of cheese and dairy dishes are consumed in memory of brave Judith. Some of the recipes collected below include some popular Hanukkah holiday favorites like challah, apple cake, hamantaschen, soft pretzels, beef brisket, and cream of artichoke soup. Although these foods are particularly significant during Hanukkah, anyone can enjoy them year-round.